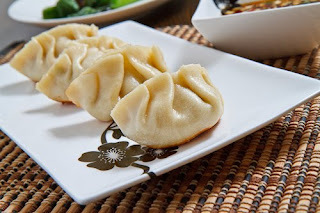 Jiaozi is pork or shrimp and vegetables that are chopped and wrapped in flour sheets. The dough is made from a mixture of wheat flour, water, and salt. This food is cooked by boiling. In Japan, similar food is called gyōza, while in Korea it is called mandu. Jiaozi is not the same as dumplings (wonton). Jiaozi skin thicker than dumplings. From the relics of the Spring and Autumn Period in China it is known that people in those days have eaten jiaozi. From inside a jar discovered from a tomb in Dunhuang from Tang Dynasty found jiaozi in a dry state.